SickStick enter the world of stand up paddle boards with a range of three all round SUPs aimed squarely at the recreational paddler. Big bold graphics that stand out in recognisable green set the brand apart from the off, while affordability, durability and ability to cope with a variety of environments will get you floating with minimum fuss and without breaking the bank. Already providing a range of cost effective paddles, SickStick’s ethos for quality at competitive prices remains intact with these new boards. The 9.6ft is the smallest in the line up but offers ample float for most. Heavyweights will probably do better with one of the bigger sizes for general flat water paddling while the 9.6ft would work better as a manoeuvrable surf SUP. On the flat the SickStick tracks well and glides as you would expect from a board this size. When chop increases and winds pick up it actually continues to cope and pinches into the breeze with minimal ‘slap’ – as long as your weight is forward and you edge properly. 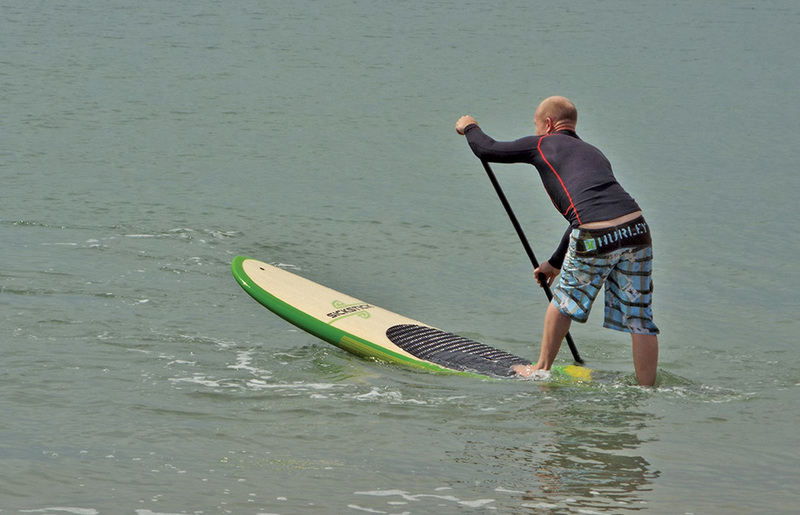 While by no means a downwind board the 9.6ft floats on runners with minimum fuss and wobble. You won’t be catching super long glides but it’s a confidence building ride nonetheless. Picking up waves with ease this is a board with a mellow personality – helping riders work on the basics of stand up paddle surfing while delivering maximum fun. It turns well off the bottom and floats back up to the lip with ease. As riders develop their skills they’ll be looking for more performance but there’ll always be a place for a SickStick when laid back rides are required. Back to flat water and the 9.6ft offers good stability, relative to its size, and would make a good first time hard board for the whole family. Durable construction means it can be bumped around, to a degree, although the extra fibreglass does add some weight. SickStick offer their stand up paddle boards with a variety of GoPro mounting options so riders can capture the action from multiple angles. The traction pad is comfy and the provided fins do their job – swapping these to something higher quality will eek out a touch more performance. SickStick make no bones about which market they’re aiming at. Focusing on recreational paddlers ensures a cost effective and versatile craft that will remain part of quivers for years. The 9.6ft is a great ‘do it all’ stand up paddle board for light to middle weights while being a good step down mellow wave SUP for bigger boned individuals.